Well, after a month off I’m back to the countdown and No. 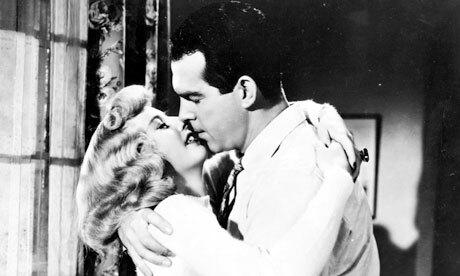 29 on the AFI list is 1944’s Double Indemnity starring Fred MacMurray and Barbara Stanwyck. It’s the story of an insurance salesman who together with the unhappy wife of one of his clients plots to kill the husband to collect the insurance money. The film, directed by the great Billy Wilder (Some Like it Hot, The Apartment, Sunset Boulevard), this film tried too hard to be a Raymond Chandler novel (Chandler wrote the screenplay from a novel by James Cain). It’s noir, but for me it is bad noir — I even laughed a few times at the faux drama. I know it was 1944, but there are so many great noir films from that period that this one pales in comparison. Double Indemnity did get nominated for Best Picture, probably because it was a crappy year for films (Bing Crosby’s Going My Way won the honor). Stanwyck was nominated for Best Actress (she also lost) and in fact the film lost all seven of the Oscars for which it was nominated. I found Stanwyck to be quite good as the icy cool murderous wife and Edward G. Robinson was great as the insurance agency’s skeptical leader. And then there was MacMurray. I was really impressed with his performance in another AFI film, The Apartment, but he was clunky and over-the-top in this performance. I know it is interesting to see the dad from Father Knows Best and the Absent Minded Professor as a killer, but it wasn’t enough for me to say this was a great performance. I’m going to chalk this one up to AFI voters who think Billy Wilder can do know wrong (he certainly is one of our greatest directors) but this is not one of his best. Overrated! YouTube is world’s largest video sharing site, no one can defeat it. Every one upload movies at YouTube then get embed code and post anywhere.